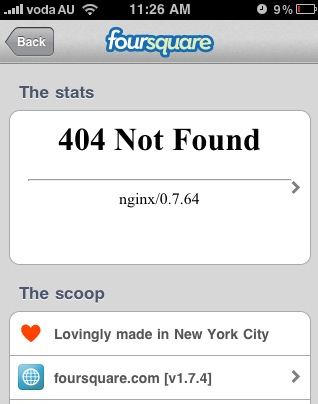 Having issues with Foursquare lately? If you use the Geo-location application Foursquare, you may have noticed lately there has been connection problems using the app which basically makes the service unavailable to users. According to Foursquare, who use the high tech Amazon EC2 cloud computing data center in Virginia – there has been problems with part of this cloud environment directly affecting the Foursquare service. This is not the first time the Amazon EC2 cloud environment in Virginia has had a major outage. In December 2009 some hackers managed to penetrate the clouds security infrastructure and a Zeus botnet was running an unauthorized command in this cloud environment. We are not sure if this outage has been caused by a system error, or a security vulnerability but hopefully all will be sorted soon. UPDATE – Foursquare have confirmed their service is coming back into operation and everything looks to be ok now.